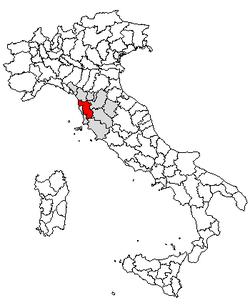 The Province of Pisa (Italian: Provincia di Pisa) is a province in the Tuscany region of Italy. The capital of the province is the city of Pisa. The province has an area of 2,448 square kilometres (945 square miles). In 2005, 394,101 people lived there. There are 39 comuni in the province. Pisa is well known for the famous Leaning Tower of Pisa,which is in the city. This page was last changed on 22 December 2017, at 13:52.